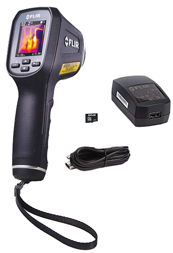 The FLIR TG165 Spot Thermal Camera lets you see heat so you know where to reliably measure it. Easily find unseen hot and cold spots for instant troubleshooting, and store images and data to show customers and include in reports. Use to show where heat loss is occuring in your house or where there are electrical hot spots. Inspect HVAC systems for mechanical wear and tear. Inspect under your car hood for overheating, malfunctions and more. This item's loan period is two week.